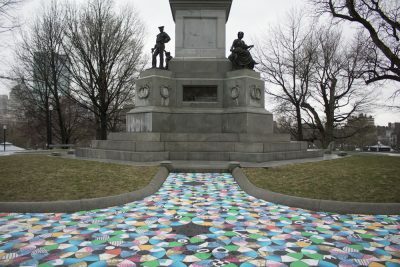 Bright colors lit up the Soldiers and Sailors Monument on Boston Common starting Wednesday as “Pathways to Freedom,” artist Julia Vogl’s newest installation, added vibrancy to the park in the spirit of spring. After conversing with 1,800 people in the Greater Boston area about freedom, Vogl installed the project that will remain up until May 2. 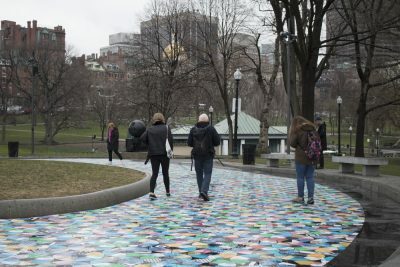 The installation features the stories of the Bostonians in the form of small, symbolically decorated metal circles installed in the ground. Vogl worked on “Pathways to Freedom” in partnership with the Jewish Arts Collaborative, a local organization seeking to showcase Jewish art in the Boston area. She explained that although the project is inspired by the Jewish holiday of Passover and its Exodus story, it also serves as a reminder of a societal need to contemplate freedom and the reasons why many people still lack it. Vogl began gathering stories from the Boston community on March 20 at venues including City Hall, the University of Massachusetts Boston and the Massachusetts Institute of Technology. Vogl said she heard from immigrants, families and students of all backgrounds and nationalities, and that she challenged them to reflect on topics such as diversity and immigration. They were asked to answer each of her questions four times, Vogl said, prompting deeper contemplation. Hardwick said he created the audio component of the installation. 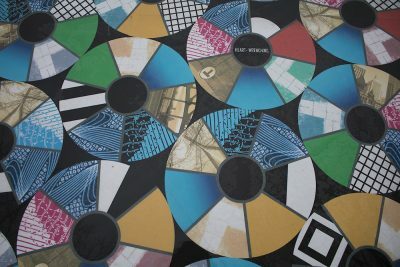 Keywords scattered throughout Vogl’s floor mural will correspond to recorded interviews on the Jewish Arts Collaborative website. More than 100 participants were interviewed anonymously over the course of a few weeks, of which 44 were selected, he said. Hardwick recalled one particularly memorable interview that he conducted with a former U.S. Marine. After the interview concluded, Hardwick said that the veteran asked another member of Vogl’s staff if a psychiatrist was available. Jim Ball, director of communications at the Jewish Arts Collaborative, said that the emotions captured in the interviews expand on the impactful storytelling of the installation by adding another dimension beyond the visual. “We believe that [‘Pathways to Freedom’] sparks people thinking about freedom and immigration in a new and interesting way,” Ball said. He said the collaborative sought out Vogl because of her successful artistic works of social protest and commentaries. Ball said they hope Vogl’s newest installation will follow suit. 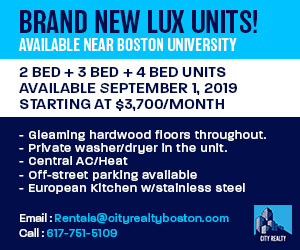 Ball worked alongside Vogl and Hardwick to select the installation location, plan the logistics and introduce the artist to local Boston culture. He also said that he looks forward to the impact of this project because it involved many participants and he felt that its message applied to the entire community. Vogl said she completed her own personal journey of self-reflection as she worked on the project through conducting research into her own past as a first-generation American, spending time to integrate herself into the Boston community and volunteering to help refugees in Lesbos, Greece. Even now, as she opens the installation to the public for its weeklong exhibition, Vogl said she is still reflecting on what she has learned.